Request Engineering Expertise | Precision-Tek Mfg., Inc.
Got some questions about the machining of a part? We can help with design for manufacturability. 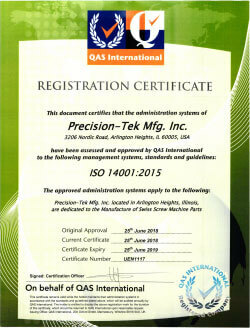 Precision-Tek Manufacturing is a leader in the Swiss machining field. We are able to meet demanding needs for precision machined components and sub-assemblies for industries including medical, automotive, fastener, hardware, motor/pumps, HVAC, motion control, oil and gas and many others. Complete the form below to provide us the details of your part and the specific questions you'd like answered. Print and/or 3D CAD file and SolidWorks files welcomed. We'll follow up soon to arrange the review when it suits your schedule.